During the second half of summer back in 2010, Woodlore Field Staff member Sarah Day took some fantastic photos of a butterfly that she had spotted. The first person who can correctly identify the species will win a £10.00 Woodlore Voucher, which can be used against any items of kit in our Online Shop or against a Bushcraft Course of your choice. Good luck! 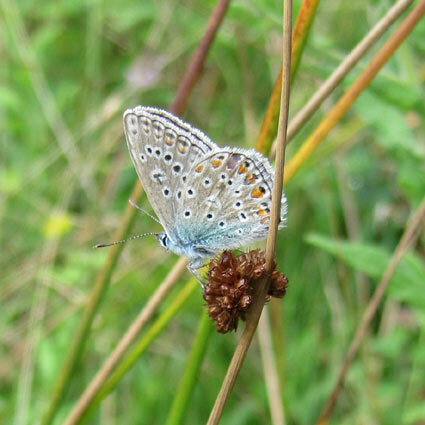 Well done to Jerome, who was the first to correctly identify this butterfly as a Male Common Blue (Polyommatus icarus). A £10.00 Woodlore Voucher is on its way to you! This entry was posted in Competitions on March 21, 2011 by Woodlore Team. Is this Butterfly a Common Blue Butterfly (Polyommatus icarus)? I incorrectly wrote the Latin name, sorry. is it an adonis blue??? Is it a common blue(Polyommatus icarus)? I’m thinking it could well be a tired looking Adonis Blue, if it isn’t then my next guess would be a maggot in a Peter Storm! silver-studded Blue by any chance?? Is it a Reakirt’s Blue? Great picture too by the way. I think this may be a male Silver studded blue ( Plebeius Argus ). i think its an adonis blue??? 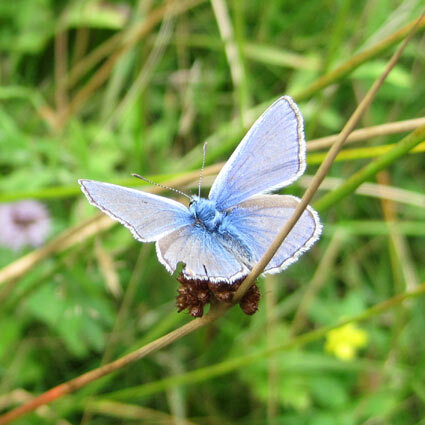 Is it the Common Blue Butterfly? Could it be a male Common Blue? It’s a Common blue (Polyommatus icarus).